Leila here again to show you my projects with the C'est Magnifique April Kits. I used the Main Kit, Flower Add-On, Embellishment Add-On and the Mixed Media Kit. All of the kits are gorgeous and it's a pleasure to work with these supplies! 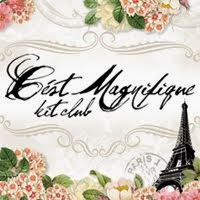 Remember you can find all the kits in the C'est Magnifique Store. So, that's it for today. I hope you enjoyed my projects. Thanks for stopping by! Leila, Loved it! The work is amazing. The second LO is my favorite. Hugs! Beautiful work with this kit Leila! I LOVE the "Sweet Girl" layout!